The "greatest two minutes in sports" will be preceded by the greatest week in sports at BloodHorse.com. With expanded video segments and our award-winning news, BloodHorse.com has the Kentucky Derby covered! 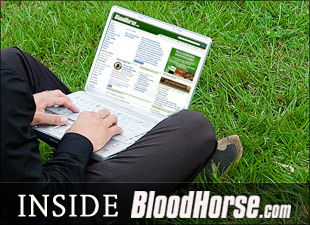 BloodHorse.com starts the week with daily video news reports and features and weaves in throughout the next six days insightful "on-the-spot" analysis, exhaustive "wire-to-wire" news and breaking information, and the best blogs and most memorable photographs in the business. Get a behind-the-scenes feel for the anticipation and excitement leading up to the Kentucky Derby. Watch candid interviews, analysis, and exclusive video from the morning works, and enjoy a daily news minute with those on the Triple Crown trail. As an added bonus, all Triple Crown video is viewable on your iPhone! New Episodes of "And They're Off" and "That Handicapping Show"
Special Kentucky Derby editions of "And They're Off" and "That Handicapping Show" deliver more entertaining, engaging, and unmatched coverage of the 136th Kentucky Derby. "And They're Off" is hosted by veteran Blood-Horse turf writers Lenny Shulman and Steve Haskin, who will be reporting from historic Churchill Downs. "That Handicapping Show", hosted by Blood-Horse racing writer Jason Shandler and Blood-Horse news editor Tom LaMarra, will offer a comprehensive preview of the Kentucky Derby. A fan-favorite, "The Morning Line" returns, this time as a live blog. Join Jason Shandler and other Blood-Horse staff members on Friday, April 30th and Saturday, May 1st for a live chat from Churchill Downs. Each day's live chat will begin at 12:00 p.m. and will run until 2:00 pm. This is your chance to gear up for the Kentucky Derby and the Kentucky Oaks with the rest of the BloodHorse.com community. This exclusive BloodHorse.com report takes an in-depth look at the pedigrees of this year's Kentucky Derby. Written by Avalyn Hunter, Alan Porter, Tom Hall, Evan Hammonds, and Scot Gillies the profiles also include a five-cross pedigree chart, TrueNicks ratings, and Brisnet.com Ultimate Past Performances to help you zero in on the winners. This year's package will also include a Leading Sires Report for Churchill Downs, and an exclusive MarketWatch Triple Crown Contenders Report. Catch up with some Thoroughbred greats who etched their name in the history books by winning the Kentucky Derby. Fusaichi Pegasus, Thunder Gulch, Smarty Jones, Big Brown, Monarchos, and others!